6-Outlet Power Bar with Surge Protector and 45 Degree Angle Flat Plug Provide additional power outlets along with reliable surge protection. This Defiant surge protector offers a 1000-joule rating and provides complete protection from power surges, spikes, and AC contamination. Its 6 outlets make it ideal for household use. 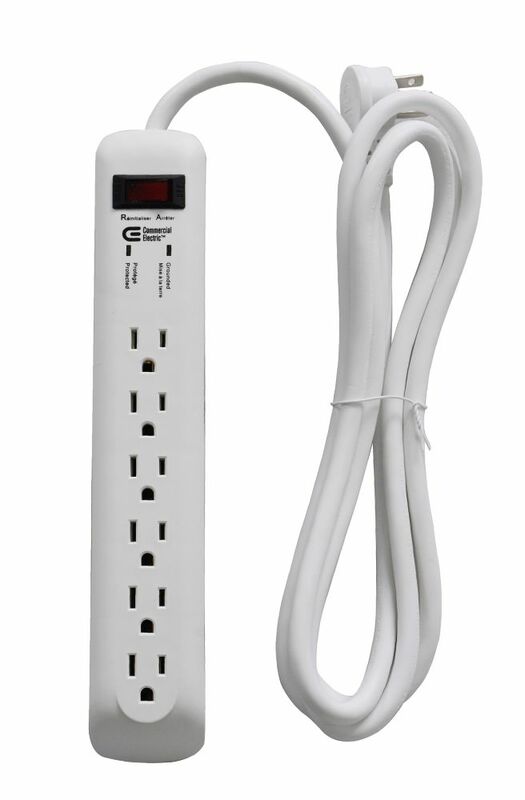 6-Outlet Power Bar with Surge Protector and 45 Degree Angle Flat Plug is rated 3.3 out of 5 by 27. Rated 4 out of 5 by Keith from Works just fine...met my expectations. Works just fine...met my expectations. Rated 5 out of 5 by JMo from Exactly what I needed! ... Exactly what I needed! Rated 1 out of 5 by MJ from Unpredictable -- fails intermittently. I plugged my laptop into the strip (with both lights work... Unpredictable -- fails intermittently. I plugged my laptop into the strip (with both lights working) and did not notice that the laptop's connector wasn't lit. Next morning, my laptop was dead. After I diagnosed the issue, I determined that one outlet was bad, plugged into another, and worked with no problem for weeks. Today my laptop is dead again. Lights work. I plugged in a phone charger; it worked. Plugged my laptop into the same outlet: no power. Retested the phone charger: no power. Nice physical design. It would be perfect If it worked. Rated 5 out of 5 by Greg from This works great ! the cord is nice and long and it had plenty of outlets for me. item in picture... This works great ! the cord is nice and long and it had plenty of outlets for me. item in picture is this item. Rated 4 out of 5 by Martin from Only problem, led light is really bright!... Only problem, led light is really bright!